Relishing a thali is a celebration in itself. Whether you're looking for proper Andhra meals or the most authentic North Indian meal with dal batti churma or butter chicken, a thali is sure to satiate all your cravings. So, here's a list of our favourites in the city and you tell us if you've tried them all. 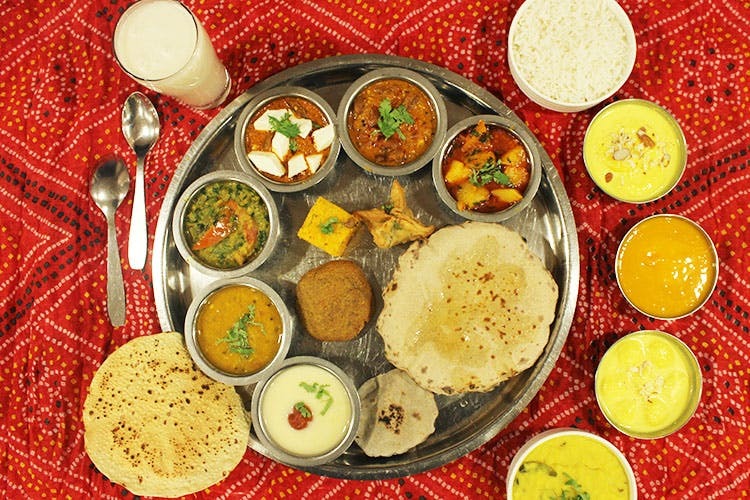 Bringing the best of Rajasthani and Gujrathi dishes together, Rajdhani is an only-thali restaurant. Indulge in the dal baati churma, dahi vada, and different types of roti made from jowar, bajra etc. Relish the dal and aloo curries or the khichdi and kadhi. There is so much more that keep arriving in your plate even if you say no. End your meal with a glass of buttermilk or malpua and other desserts served with your thali. Although the thali is priced at INR 490, on Tuesdays, you can grab it at INR 250. If traditional Telugu delicacies are your thing, then you cannot miss out on the South Indian Thali at Spicy Venue. We love the dal and the flavoured rice and usually, keep asking the staff to refill our dal. Also what takes us back to Spicy Venue is — Apricot Delight — a custard-based dish that’s made from apricot and hits the right spot. With a sweet ambience that deserves a spot on Instagram and food that's a truly gastronomical experience, a meal at NorFest is unforgettable. The Punjabi Special Non-Veg. Thali is perfect for those chicken lovers as it has a different curry every day. Accompanied by dal makhni, raita, roti, rice, and dessert, this is sure to fill your tum for all the right reasons. Reminding you of an organic farm, Ahobilam Foods is a restaurant that serves food made from millets. If you are interested in exploring a different cuisine which is also pocket-friendly and healthy, we recommend trying this. The Millet Thali is served with millet roti, millet rice, brown rice as well as curries, sambar, and rice. Got a thing for seafood? Then, you, my friend, must dig into the Special Rayalaseema Seafood Thali that comes with prawns, fish alongside other regional delicacies like ragi sangati, jonna rotte and thali regulars like dal, sambar, rice, and curries. They also have other thalis like Veg and Non-Veg that comes with meaty goodness like mutton, chicken, kheema etc. This is love!